I’d been playing with importing sequences of wavefront object files as a way of bringing animations into Vue from other applications. 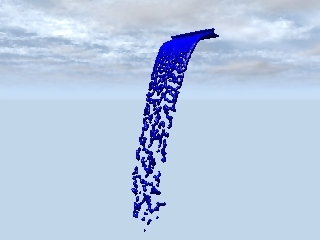 Yesterday someone asked about importing a sequence from RealFlow. Fortunately I have a none commercial use copy of RealFlow that came on a cover disc a while ago. So I’ve been trying to get a reasonable import. I’ve got the object sequence coming in without too much problem and then cleared up a problem with flicker. Now all I have left to tackle is the scaling of the objects which is causing some problems. Hopefully I’ll find a fix soon.